Aortic valve replacement is the insertion of a mechanical or tissue valve in place of the diseased native aortic valve. Aortic valve replacement is necessary when the aortic valve has become diseased. The aortic valve can suffer from insufficiency (inability to perform adequately) or stenosis. An insufficient valve is leaky and allows blood flow retrograde from the aorta to the left ventricle during diastole. A stenotic valve prevents the flow of blood antegrade from the left ventricle to the aorta, during systole. Either situation can result in heart failure and an enlarged left ventricle. With aortic stenosis (narrowing), angina pectoris, fainting, and congestive heart failure will develop with the severity of the narrowing. There is an increased rate of sudden death of patients with aortic stenosis. Dyspnea (labored breathing), fatigue, and palpitations are late symptoms of aortic insufficiency. Angina pectoris is associated with the latest stages of aortic insufficiency. Congenital birth defects involving a bicuspid aortic valve can develop stenosis. These patients may become symptomatic in mid-teen years through age 65. Patients with a history rheumatic fever have a disposition for aortic stenosis, but may live symptom free for more then four decades. Calcification of the aortic valve tends to effect an older population with 30% of patients over age 85 having stenosis at autopsy. Patients with aortic stenosis who have angina, dyspnea, or fainting are candidates for aortic valve replacement. Asymptomatic patients undergoing coronary artery bypass grafting should be treated with aortic valve replacement, but otherwise are not candidates for preventive aortic valve replacement. Patients with a history of rheumatic fever or syphilitic aortitis (inflammation of the aorta) face the possibility of developing aortic insufficiency. Successful treatment has decreased this causative relationship. Primary causes of aortic disease commonly include bacterial endocarditis, trauma, aortic dissection, and congenital diseases. Patients showing acute symptoms, including pulmonary edema, heart rhythm problems, or circulatory collapse, are candidates for aortic valve replacement. Chronic pathologies are recommended for surgery when patients appear symptomatic, demonstrating angina and dyspnea. Asymptomatic patients must be monitored for heart dysfunction. Left ventricular dimensions greater then 2 in (50 mm) at diastole or 3 in (70 mm) at systole are indications for replacement when aortic insufficiency is diagnosed. femoral artery and vein. A combination of cannulation sites may also be used. The heart is stopped after the aorta is clamped. The aortic root is opened and the diseased valve is removed. 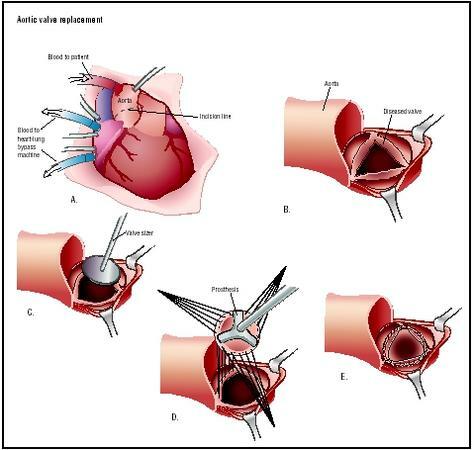 Sutures are placed in the aortic rim and into the replacement valve. The replacement valve can be either mechanical or biological tissue. The replacement valve will be sized prior to implant to ensure that it fits the patient based on the size of the aortic valve annulus. Once seated, the valve is secured by tying the individual sutures. The heart is then deaired. The cross clamp is removed and the heart is allowed to beat as deairing continues by manipulation of the left ventricle. Cardiopulmonary bypass is terminated, the tubes are removed and drugs to reverse anticoagulation are administered. A heart valve is an orifice that blood passes through in systole, and it is also an occluding (blocking) mechanism necessary to prevent the flow of blood during diastole. Heart valves can be mechanical or biological tissue valves. For patients younger then 65 years of age, the mechanical valve offers superior longevity. Anticoagulation is required for the life of the patient implanted with a mechanical valve. The biological tissue valve does not require anticoagulation but suffers from deterioration, leading to reoperation particularly in those under age 50. Women considering bearing children should be treated with biological tissue valves as the anticoagulant of choice with mechanical valves, warfarin, is associated with teterogenic effects in the fetus. Aspirin can be substituted in certain circumstances. Initial diagnosis by auscultation (listening) is done with a stethoscope . Additional procedures associated with diagnosis to judge severity of the lesion include chest x ray , echocardiography , and angiography with cardiac catheterization . In the absence of angiography, magnetic resonance imaging (MRI) or computed tomographic (CT) imaging may be used. The patient will have continuous cardiac monitoring performed in the intensive care unit (ICU) postoperatively. Medications or mechanical circulatory assist may be instituted during the surgery or postoperatively to help the heart provide the necessary cardiac output to sustain the pulmonary and systemic circulations. These will be discontinued as cardiac function improves. As the patient is able to breathe without assistance, ventilatory support will be discontinued. Drainage tubes allow blood to be collected from the chest cavity during healing and are removed as blood flow decreases. Prophylaxis antibiotics are given. Anticoagulation (warfarin, aspirin, or a combination) therapy is instituted and continued for patients who have received a mechanical valve. The ICU stay is approximately three days with a final hospital discharge occurring within a week after the procedure. The patient receive wound care instructions prior to leaving the hospital. The instructions include how to recognize such adverse conditions as infection or valve malfunction, contact information for the surgeon, and guidelines on when to return to the emergency room. There are unassociated risks with general anesthetic and cardiopulmonary bypass. Risks associated with aortic valve replacement include embolism, bleeding, and operative valvular endocarditis. Hemolysis is associated with certain types of mechanical valves, but is not a contraindication for implantation. Myocardial function typically improves rapidly, with decrease in left ventricle enlargement and dilation over several months, allowing the heart to return to normal dimensions. Anticoagulation therapy will be continued to elevate the INR to between 2.0 and 4.5, depending on the type of mechanical valve implanted. Implantation of biological tissue valves with maintenance of an INR of 2.0–3.0 for the initial three months post implant are associated with blood clot complications. If non-cardiac surgery or dental care is needed the antithrombotic therapy will be adjusted to prevent bleeding complications. There is a 3–5% hospital mortality associated with aortic valve replacement. There is an average survival rate of five years in 85% of patients suffering from aortic stenosis that undergo aortic valve replacement. Structural valve deterioration can occur and is higher in mechanical valves during the first five years; however, biological tissue and mechanical valves have the same failure incidence at 10 years, with a 60% probability of death at 11 years as a result of a valve-related complications. Patients with a mechanical valve are more likely to experience bleeding complications. Reoperation is more likely for patients treated with a biological tissue valve, but not significantly different when compared to their mechanical valve counterparts. This combines to an average rate of significant complications of 2–3% per year, with death rate of approximately 1% per year associated directly with the prosthesis. Balloon valvotomy may provide short term relief of aortic stenosis, but is considered palliative until valve replacement can be accomplished. Aortic valve repair by direct commisurotimy may also be successful for some cases of aortic stenosis. Medical treatment for inoperable patients with severe aortic stenosis is used to relive pulmonary congestion and prevent atrial fibrillation. Severe aortic insufficiency can be treated with medical therapy. Pharmaceuticals to decrease blood pressure, with diuretics and vasodilators, are helpful in patients with aortic insufficiency. Hensley, Frederick A., Donald E. Martin, and Glenn P. Gravlee, eds. A Practical Approach to Cardiac Anesthesia. 3rd Edition. Philadelphia: Lippincott Williams & Wilkins Philadelphia, 2003. Bonow R, et al. "ACC/AHA Guidelines for the Management of Patients with Valvular Heart Disease." JACC 32 (November 1998): 1486–588. Hospitals with cardiac surgery services provide aortic valve replacement. Specialization is required for young adults and pediatric patients. Cardiovascular and cardiac surgeons are trained to provide this treatment and the initial follow-up care. These surgeons are trained in their cardiac surgical residency to evaluate and perform these procedures and to care for the patient during the post-operative period. What type of valve is best suited for me? What are the pros and cons associated with each type of valve for a person with my disease and/or associated diseases? Why am I a candidate for valve replacement? Are there any other more suitable alternative procedures? If I am a female interested in having children, or currently pregnant are there additional options? How often has the surgeon performed this procedure and what are the morbidity/mortality statistics for this surgeon and institution? If I have an associated disease or complicated scenario does the surgeon have experience with follow-up care? I had an aortic valve replaced Aug 04,aged 56 there was some chest pain afterwords but I got great pain relief, I was home after a week and made a good recovery, you need to give yourself 3 to 6 months to to fully get over the operation. In my case I new that I might need the operation for many years,(I had heart surgery when I was 14 years old)so in many ways it was a relief to get it over with. i would like to thank who ever created this website. I had 2 AVR's done in March, and July 2008. I had a pharmaceutical cardioversion to address the A fib. I am now told I have Aortic Stenosis, but a redo redo is out of the question, due to the lack of tissue to sew a new valve into. I have heard that the homografts may address this prior to a heart transplant. I have the symptoms of labored breathing, fainting occasionally and edema. I adress the excess fluid buildup through diuretics before CHF occurs, but I am feeling a sense of doom about my longevity. Any suggestions? I am a 56 year old male -- i was born with a bicuspid aortic valve which is now suffering from stenosis and leaking --in addition the recent angiogram shows an aortic aneurism.I have been advised that i will require a valve replacement --i am curious as to usng a biological valve as opposed to a mechanical valve--i am a very active person--never sitting still and always finding something to work on. i do suppose that the mechanical would be better suited for my needs. I'm just wondering what sort of a time frame I might be able to expect as far as longevity. At my current level of health which is quite good, aside from the fact that i am also diabetic but under control-- I guess 10 or 11 years is about it ? I guess 10 or 11 years is about it ? I hope not. I'm 43 and had a mechanical valve put in 6 years ago. I was told the mechanical valves can last at least 50 years, but what they are seeing is more like 20 to 30 years, but even that was misleading because most people are over 50 when they get the valves. I'm fine other than getting agina when I excercise. It makes it difficult, because I'm a little over weight but when I try to excercise to help lose it I have to take it easier than the rest of my body wants. Over all though I'm good and I hope to be for many years to come. I hope this article is wrong in stating mechanical valves are also failing at 65% after 10 years. Its the first article I've seen that says that for mechanical valves. I had my aortic valve replaced with a mechanical one almost 3 years ago at the age of 44. Before my surgery I was very active and was in good shape. Since my surgery my life has never been the same. I have had a lot of complications since getting the mechanical valve. I have periods of shortness of breath and chest pain. I have an echo's done every 6 months, but my doctors have been telling me everything is fine. However, 3 weeks ago I became very ill and I was vomiting what looked like coffee grounds. My doctor warned me about this because this is a sign of internal bleeding. Since I have a mechanical valve it requires me to be on coumadin and there is a big risk of bleeding. In addition, when I went to emergency for the vomiting they did another echo which now shows there is an increase in mean gradient pressure of my mechanical valve. The mean gradient pressure for my mechanical valve has been a mean of around 10 since surgery 3 years ago, but now it is at mean of 24. Does anyone know what would cause this increase and should I be worried? I'm seeing my cardiologist on June 22nd, but I worried that something is seriously wrong. I have a lot of shortness of breath, chest pain and dizzy spells. I was 19 when they discovered i have a leaky aortic valve. The Doc told me that they would be doing surgery within 10 years (6 years ago) and it will be a tissue replacement. I was born with a congenetal heart defect and had open heart surgery for VSD age 4. I´m now 25 and terrified about having to repeat this every 10 years or so and I really was hoping to start a family in the next 2-3 years but I´m worried about the complications. The worst thing is that I know after the surgery, it doesn´t end. I feel terrible for my family, after all these years of hospitals and tests and I wouldn´t want to put my partner through any of this. My mom had a pulmonary valve transplant.Does anyone know any information or know where to find it including pictures? I have just undergone an open heart surgery for replacement of the aortic valve. I have too many people telling me what food I should avoid and the precautions to be taken. I would like to know what food should be avoided and the precautions to be taken post surgery. I would also like to know what symptoms should I be aware of. My mom had aortic valve replacement 2 weeks ago. She is suffering from extreme soreness in her chest which she thinks is from the incision. It hurts the most when the nurses put her in bed during the process of laying her down on her back. It also hurts some during physical and occupational therapy. Is this normal 2 weeks after surgery? Excellent information!! I have shortness of breath and have been to my cardioligist but no answer as to why! Do you have any suggestions? I am a second year medical student doing a project on aortic valve replacements. Would it be possible for us to use the image of the procedure on a wiki that we have to submit to the University of Edinburgh? Would be very much appreciated. Thank you! question? invasive mitral valve replacement , It was during plantation of the bio-prosthetic mitral valve that the femoral arterial line somehow dislodged. The surgeon thought that the fixation of the arterial line was adequate with the line being sutured to the skin and the perfusionist did not report any particularly high line pressures but it may be that the line worked its way out of disease or dissection in the right sided iliac artery. Despite a couple of attempts was unable to replace patient unperfused for a period of time of approximately 15mins. is it common to use the wrong size aortic valve during replacement surgery? I have had my aortic valve replaced twice, in 2003 and 2007. Yesterday I had an emergency whilst driving. My vision became blurred, severe chest pains, sweating profusely and my tongue became very thick. I managed to stop my car and call for help. The ambulance arrived, I was rushed to hospital. Tests were done and was told that all was clear and that is was an anxiety attack. has anyone had this kind of experience? What does it mean when the doctor said we need to clean the blood of a patient in ICU currently using an artificial heart? This is some one I know but not close to only by marriage. But I just want to know what is it. I am an RN in geriatric medical ward. My mother who is 85 has been advised replacement of aorta. she has not co-morbidities (e.g blodd pressure, diabetes, asthma). Her angiogram showed a normal heart, and her coronories are open. 2. After surgery her quality of life will not change, and the risks she faces with aorta labled 'severe' will remain even after the surgery. Are the concerns of those opposing surgery valid ? wife 74 just had AVR, replacing a Bicuspid with a tissue valve 2 weeks ago. day after operation her heart stopped and was revived within minutes with CPR. Two days later a standard (non-defib) Pace Maker was implanted. I had avr and septal myectomy done 7 weeks ago and am experiencing increasing dizziness. Does anyone know anything about this? She hasn't been seen by cardiologist yet! But can anyone tell me what this means for her. where can I read the replies to these 26 statements/questions these person(s)have asked? i had complications of chest pain for several years(6-7 years), i visited a doctor today and i have been told am a candidate of aortic valve replacement, but i don't want to do the surgery for now, am now 22 years old, and i want to undergo the surgery after 3-4 years from now, any help in terms of the urgency needed and my intention to differ the surgery? My Mother underwent a on Aortic Heart Valve Replacement in July 2014 in Rogers Arkansas. The Doctor installed too large of a valve into her heart to begin with. So within hours they had to open her chest up fully and redo the surgery. The surgeon stated that the first replacement valve blocked blood flow to her heart. This eventually led to her death within three days because of issues stemming from the installation of the wrong valve. Before the surgery we were told that there was a 98% chance of survival the extra 2% related to human error. My mother fell into the 2% category. The hospital and their staff could not give us an explanation as to WHy this happened. It took three attempts and contacting getting an attorney involved before the hospital provided us with the Autopsy. Needless to say it was like pulling teeth to even get the actual medical reports. On three different attempts we have received three different sets of records even though we requested ALL documents for her. So choose your doctor carefully one 2mm mistake by them could cost you your life. I was also told her condition could be inherited genetics. That knowledge concerns me because if I happened to inherit these genetics then I do not know if I will be able to move forward with this procedure if I need it because of this surgeons 2mm mistake with my mother. My mother,73, had a valve replacement yesterday, she is in recovery, but has double vision, can anybody comment on this, as Dr. has no answer for us. My sister, age 64 underwent Aortic Valve Replacement after diagnosis of Aortic Stenosis Heart Disease. A biological valve was used with pig material. She developed Kidney Failure and Dialysis done practically on a daily basis. She gets 4 hours Hemo Dyalysis most every day. She had to have a Ventilator put In for breathing a second time the 2nd day after surgery, it has been removed now. She gets breathing treatments now to cough up phlegm. Needless to say, all these treatments and trying different things have not got her out of ICU after 19 days. Her situation is complicated by Diabetes. Are they over treating her, she is only half as well from the first day of surgery. What could be missing. She has had a Nephrologist, and an infectious disease Doctor, with no answers. She has a very good Heart Surgeon, Dr. John Forman, Head of Cardiology, and Head Surgeon at St. Joseph Hospital, KC., MO. He was Best Cardiac Surgeon in the USA in 2011. So I watch helplessly for my sister to get better. She gets no rest, they are constantly doing things, and she gets no rest. I was diognosed with mild aortic regurgitation at age 32 I am now 52 - I think surgery is in the very near future for me. I'm FREAKING OUT!! I haven't been able to sleep. My anxiety level is out of control. Please help. I'm SO scared. Reading some of the posts is beyond of what I can handle!! I'm thinking surgery may be to much for me to handle- I guess hospice??? I'm only 52. I just feel like I have no other choice! My 68 year old mother just had aortic valve replaced and within an hour went into cardiac arrest. Two hours later still in arrest they took her to Cath lab only to find that the surgeon knocked a piece of calcium loose and blocked her artery which they were all very very clear beforehand. She had total right heart failure and is still in critical condition. Hi I have a question I get my heart surgery done here in like 6 weeks and I wanted to know that since I have Diabetes, high blood pressure, aside reflex, Arthritis, and I had prostate cancer, if there is a way for me to make it threw my surgery? I am almost 69 years old and I just wanted to see if you would answer my question as fast as you can. Aortic valve replacement mid February. Sent home by 5th day. In the beginning every thing ws fine; then shortness of breath set in, along with severe pain in the shoulders. Sent to ER by cardiologist and admitted. New test, new echos, new EKGs. They called in I.D. doctor, who put him on antibiotics I.V. Pain starts to subside and he is dismissed. Now, after 2 great weeks at home, shortness of breath is back, and the pain is back. Tylenol does not even touch the pain. Blood pressure is fine, but heart rate is high. Cardiologist suggests the E.R. again, but he refuses to go back. Any advice? ? Zachary just had my arotic valve replaced 3 weeks ago,I m 38 years old so we decided on a mechanical valve. It's a little scary having to do this at a young age,but in my opinion the surgery is a major event but if you are in good health otherwise you will have no problem. As far as the survival rate,it is very good. And if you follow everything your doctor says you be just fine.as far as the catheter,and things like your in they will take them out as needed usually they start the first day after surgery,as you get feeling better the more stuff they take off,the catheter is usually first. I wish all the luck,and hope you have a great recovery. All and all it isn't that bad it just takes time and patience don't over do it. And as far as the surgery you won't remember any of it,or feel any of it. Once again good luck to you. My mother had aorta replaced with pig valve about 12 or 14 yrs ago. The warranty ran out on the valve replacement about 2 yrs ago. When the surgery was done, she had complications in the ICU and they rushed her back into surgery. The whole family was very upset and frightened for her. She was released and her wonderful husband helped her shower and do everything and she needed he helped her with until she was healed and able to do own her own again. For the last several yrs she has been widowed now, and she lives close to my brother and each night her heart would pound and her blood pressure would be too high and she would call my brother and the ambulance. Any time she would wait it out my brother would come over to sit with her. This went on constantly. One night she finally couldn't take being alone anymore and she drive herself to my brothers house at 3:00am and told him she could no longer live alone. He took her in and they sold her home and she has talked about her heart valve running out of warranty almost daily for a couple of years I guess. She is falling each time she gets on her feet now. She cannot hold herself up and wets her pants. She cannot tend to her briskness anymore, she forgets everything and when she talks she says strange things. We can not take care of her 24/7 and my brother will take her to the dr st 2:00 pm to get her into a facility and hospital for testing. They sat there in the waiting room emergency room for 6 hrs already and she couldn't sit any longer with her bad back. She is in terrible shape and seems to be in another world already. Has anyone of you lost someone from a failing heart valve? Pigs only live 15 yrs is what I read. Someone please help me. I believe this may be happening. Please share your knowledge with me about symptoms before death. Please. Thank you. Hang in there I'm 61 with a "Cow" aortic valve... Had the surgery in 2012 and have had no complications! I just wanted to encourage anyone having to go though decision anxiety... just do it, most people have a very good outcome, like me. And I am reading way to much doom and gloom here... yep. Most importantly, pray to God for wisdom and healing. At the age of 22 in 1978 I had an aortic valve replacement mechanical. Last week I celebrated my 60th Birthday. I also had a second child 4yrs following surgery. I have had many health problems including M.E for at least 30yrs and several life saving surgeries mainly due to complications caused by warfrin. In 1978 I was told that my valve should last 15yrs but as you can see I'm almost 38yrs post surgery with my trusty valve. I have accessed this sight because I am now experiencing some worrying heart symptoms. I just wanted to give everyone hope for the future, I have and do enjoy a wonderful life, despite many health limitations. I say go for it you have nothing to lose and everything to live for. i AM 36 living in ireland and within the last two weeks have been informed that i need AVR as my existing valve is leaking, i am getting serious blurred vision my bp is crazy, but i remain positive i want a human/pig valve as the thought of warfin is something i dont want.Reading these comments has given me hope my wife and two boys have giving me this strength. One month and several weeks ago i had an aortic valve replacement surgery. However my doctor said that the valve regurgitates. I want to ask did, this ever happend to anyone here? (beacause i thought that this may be just because the heart didn't recover completly ) is it something normal or I should panic ? My 70 year old mother just had minimally invasive aortic valve replacement surgery using a bovine valve. She had several complications right after the surgery. I believe it was because the surgeon did not insert drainage tubes during the surgery. She develooed fluid/blood around her heart and required a second surgery to drain the fluid and drainage tubes were inserted. Than a pace maker. I believe the lack of drainage tubes permanently weakened her heart and caused afib among other things. Please, anyone who is getting this surgery, make sure you ask the surgeon about drainage tubes. My 77 y/o mom died after this procedure done w/the cathedar ..She was in much leg pain, could barely move around w/her cane..mom was in constant leg pain/weakness since the procedure: 4/16 at USC & died 8/16..suffered for 4 months then did not wake up one morning..mom was relieved of her pain..sleep well mom..she was an active woman prior to this surgery..cleaning cooking doing laundry, gardening, going to casinos..she was on a heart pill but independent...I don't know but this surgery really tortured mom.. I receive a bovine aortic valve a year agp. I was told it was due to a birth defect and is genetic. Through this article I realize my maternal grandmother had the same thing. I was told the left side of her heart died. In 1982 that was their way of diagnosing this disease. I also inherited Asthma and Menieres Disease from her side of the family. It shows me my grandmother was from an unusually afflicted area. Her family originated in England. My maternal grandfather died 1961,of a heart attack at 62. His point of origin was Dutch West Indies. I am now 70 and wonder if I can get records of their deaths still. It would be interesting. Thank you for this exciting information that takes me more in depth to something that could have shortened my life immensely. I was rushed to the hospital for one thing and found my life was saved. My father has undergone a mitral valve transplantation surgery. It is replaced with mechanical valve. It's been a year now. But he is showing symptoms of blood clot over the surface of the new valve. What measures should we take? I am 77yo.I had a St Jude Aortic Valve Replacement 1995 and been on Warfarin ever since. I have had 2 hip replacements am a controlled epileptic I have never suffered any complications until the last 3 months. I have developed intermittent high blood pressures 190/95 worst was 204/98. Any one know whether this is common. None of the Doctors have mentioned any thing related to the valve. They haven't recommended any medications. From supply Chain point view, when the surgeon measure the size of the valve by heart valve sizer while doing the surgery of implant the heart valve , does the surgeon choose the proper valve from a set of valves available ? I meant the manufacturer and supplier of the artificial heart valves afford heart valves as a set of different sizes or what? I am 58 years old male, 2 years back replaced Aortic valve(Tissue Valve),ascending aorta and removed two blocks from artary. Until now i am 100% Ok and working as a sales Engineer in a Multinational company.